​Last day to drop off donations is May 18. ​Currently our drop off donation appointments are available on Tuesday, Thursday and Saturdays each week. *please note: if no deliveries are scheduled by a prior appointment, volunteers may not be at the unit for the entire 2 hours. Volunteers will be at the storage unit as needed to sort and price and meet supports who have scheduled appointments. LAST DAY TO DONATE: MAY 18! we need to rest up the two weeks before yard sale! IF it rains, the yard sale will be the following weekend. - Home Décor: framed pictures, posters, curtains, mirrors, knick-knacks, etc. - Toys, Games, Stuffed Animals. or if you can hold on until day of yard sale and deliver to us at the site. - Baby/Young Children's clothing - in good condition. For large pieces of furniture, we have limited space at storage but if you are willing to take photos and send to us we could list items in an album on our Facebook page and indicate proceeds donated to Sparkle Cat Rescue. 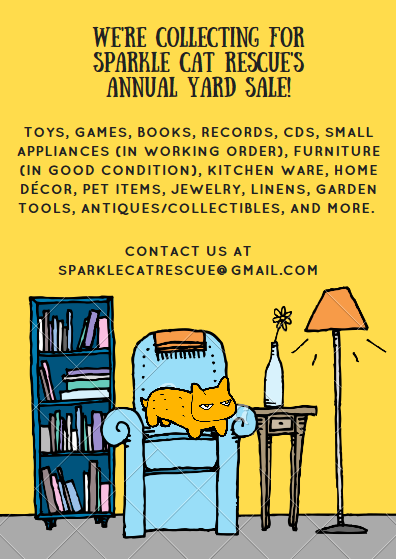 WANT TO VOLUNTEER TO HELP AT OUR YARD SALE?